Andrew Balbirnie's unbeaten century helped Leinster Lightning to a 19 runs (D/L) win over the NW Warriors in the Inter-Pro Series opener at The Hills. Balbirnie (103 n.o.) shared a stand of 187 in just 128 balls with Kevin O'Brien (98) after Lightning had been reeling on 46-4 chasing 286. Rain intervened with Leinster on 254-7, 19 ahead on Duckworth/Lewis. The Warriors posted 285-4 with half centuries from Johnny Thompson, Stuart Thompson, and Jason Milligan. The Thompsons shared an unbroken fifth wicket stand of 105 in 77 deliveries, with Johnny's 66 coming from just 47 balls and including five sixes and four fours. Middlesex opener Balbirnie scored a run a ball undefeated 103, which included 13 fours and two sixes, as the bat dominated the ball on a wonderful track at Milverton. 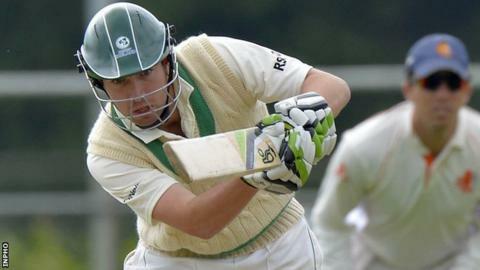 Irish international O'Brien was at his destructive best, smashing 98 from just 67 balls (11 fours, three sixes) before his match-winning stand with Balbirnie was ended in the unluckiest of circumstances. A fierce drive from Balbirnie was deflected onto the stumps via the boot of Johnny Thompson with O'Brien stranded out of his crease. The next Inter-Provincial action takes place at Coleraine on 26 May, when the Warriors host the Northern Knights in another 50-overs encounter.